Rose Quartz from Brazil tumbled to a smooth finish, an ideal pocket size stone, small enough to carry around with you. Tumble Stones can also be placed around the home for their energies or can just be nice decorative items. 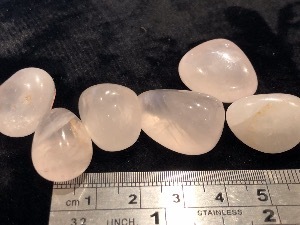 Rose Quartz crystal gemstones of varying sizes selected specially for your order. 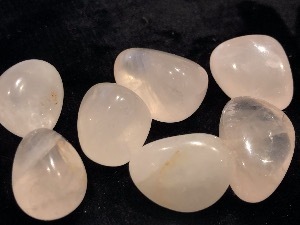 Rose Quartz is a member of the Quartz family, a silicon dioxide crystal with a hexagonal (trigonal) crystal system. It usually occurs in massive form but sometimes grows in clusters of small prismatic crystals. It’s name is derived from it’s colour, which ranges from very pale pink to deep reddish pink. It’s clarity can range from opaque to translucent to transparent, although most transparent pieces are rather foggy. Rose Quartz is found in Brazil and Madagascar, as well as South Dakota in the USA. Rose Quartz is said to be one of the most humble, yet powerful of the spiritual allies. It’s said to to help calm the mind, assisting one in releasing worry, fears, anxiety and past emotional trauma. It may clear the emotional body of ego-driven patterns and may help one feel more open to receiving and sharing love, compassion and kindness. It is said to be a gentle stabilising stone for physical heart trauma and imbalance. It may help the heart make the shift from stress-based physiology to the higher frequencies of love-based physiology. It is said to ideal for premature babies and young children with heart weakness or disease but may be used by anyone who needs a stronger, more stable heart.